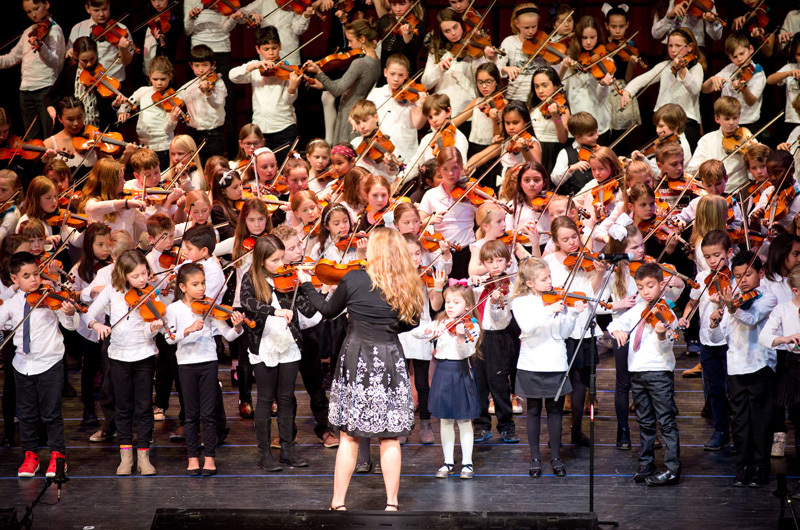 Chelsea Pennebaker leads a cast of nearly 200 at the annual Strings concert, held on Thurday at the PAC. 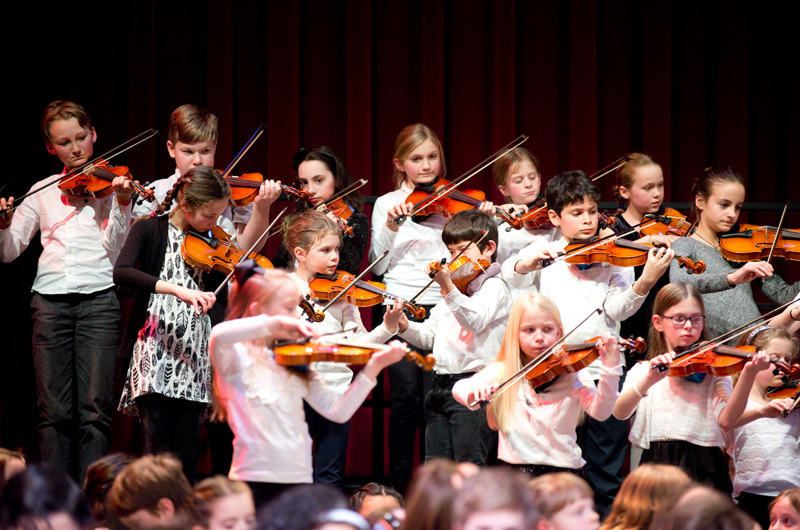 On Thursday evening for the annual strings concert, the performing arts center at the Martha’s Vineyard Regional High School began to fill up with parents, grandparents, siblings and little musicians toting instrument cases nearly as big as themselves. More than 190 children performed, some for the first time, others seasoned veterans who have participated in the program for years. In the audience, parents carried bouquets, cameras and younger siblings on their laps. Joseph Rock of Edgartown came to watch his two daughters: Madison who has played in the program for five years, and his younger daughter, Grace, who has been playing for three years. “Sometimes it gets a bit squeaky, but you just grin and bear it,” Mr. Rock said of practice sessions in his house. Instructor Nancy Jephcote understands. “It’s not easy being a string parent,” she said. 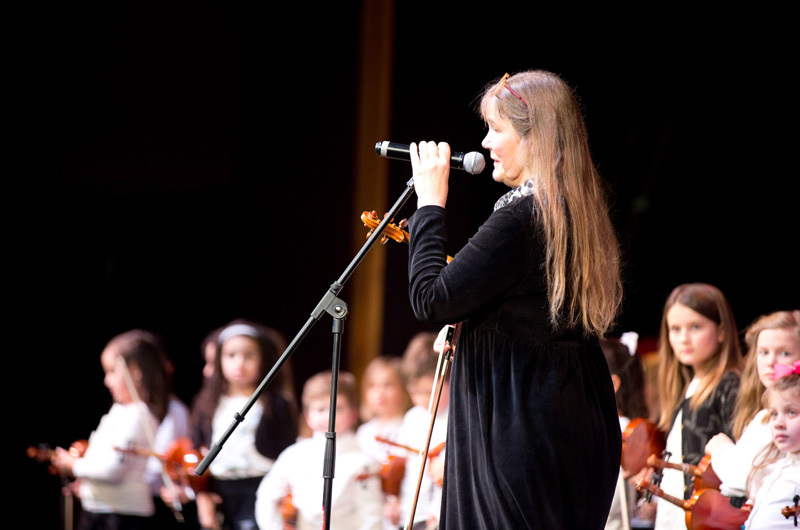 Ms. Jephcote has been working with the Island schools strings program since 1986, and has taught thousands of students. Lessons are hosted by Martha’s Vineyard public schools and are available for free to all Island kids. By the end of the performance, all of the children were on stage for the finale, Mozart’s Twinkle Theme. Making their way off stage after the performance, Hannah and Sofia both said they want to keep playing next year. Ms. Jephcote, Ms. Pennebaker and Rebecca Laird have inspired many children to feel that way. The show included advanced pieces from musicians who have participated in the program for several years alongside performances from the beginner group who were just learning how to hold a bow. Yay for the strings program on the Vineyard! We are so grateful for Nancy Jephcote. Her enthusiasm and love for this art inspires her students endlessly. Having moved from the Vineyard a year ago, and now being at a Waldorf school where there is a strings program as well, my daughter still misses her lessons with Ms. Jephcote. She is a gem. I started playing the violin in the 4th grade at the Edgartown School and then in the school orchestra up thru the 12th grade. Wonderful experience. So glad so many children on the island are continuing tohave this expeerience. "Attitudes are contagious" Nancy's have been worth catching! Learning to play the violin at an early age helps to strengthen the muscle know as our brains. Young fiddlers develop a stronger ability to concentrate while being able to appreciate the learning process, not just the prize. The Suzuki method was consciously designed to create good people more so than great musicians.